When you switch your phone from iPhone to an Android phone, the top concern must be how to move SMS between these two phones supported by totally different systems. What makes text messages so important, especially to the merchants, is that SMS may cover your chat transcripts with your family, friends, workmates as well as records about business. Losing all previous SMS or failing to export SMS to the new phone will cause a series of problems. In fact, your worry is no trouble at all. I will recommend two solutions to you, hoping to be helpful. 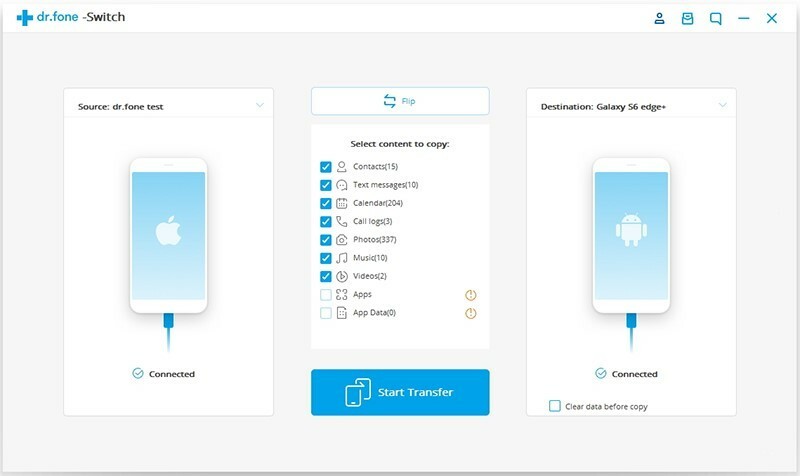 This powerful tool – Phone Transfer enables you to move text messages from iPhone to Android effortlessly with just one click. Phones like iPhone 7, Samsung Galaxy S8/S7 and so on are all in the list of supported phone models. Text messages that involve with recipients, senders, texts, and photos can also be easily and perfectly transmitted with the help of it. One of its distinct advantages is the fairly simple using process and two USB lines respectively for iPhone and Android are all you need to prepare. So let’s take a look at the straightforward operational process and feel its powerful function. Step 1: Go to the Phone Transfer, and click “Switch” on the dashboard. Step 2: Connect both your iPhone and Android phone to the PC via USB cables. If they are properly connected, the software can detect automatically and fast. Note: There is a light blue button “Flip” in the middle of the interface, you can click it if the positions of the source phone and the destination phone are reverse. Step 3: Select the option “Text messages” by ticking in the small frame. Make sure you didn’t tick the option under the image of the destination device named “Clear data before copy” for the reason that data on your Android phone will be probably covered or erased if you tick it. Finally, click “Start Transfer”. Note: It may take you some time to transfer data and the requisite time depends on how many text messages there are on your iPhone. Although the method introduced here is completely free, you may need to spend more time finishing all those intricate steps and connect your phone to WI-FI because you need to download two apps on your Android phone next. Don’t be so discouraged or impatient, I will show you this way step by step in the following. 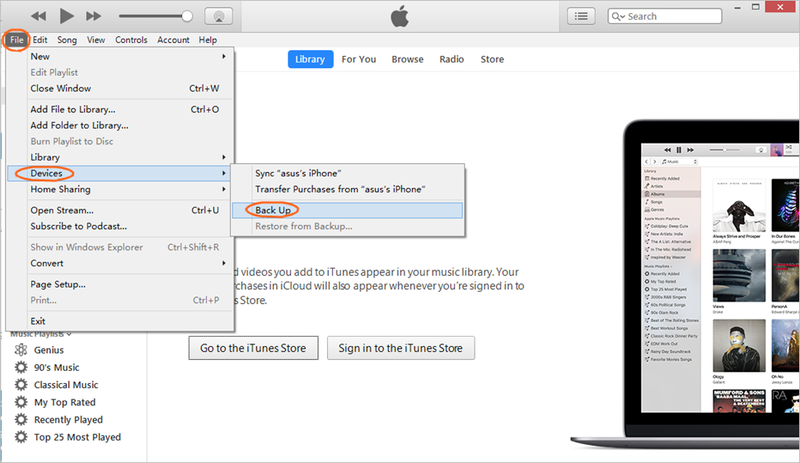 Step 1: On your computer, download the latest version of iTunes and launch it. Step 2: Connect your old iPhone to the computer via USB and then in the interface of iTunes, choose File > Devices >Back Up. In the order directory above and you’ll see a number of folders named with random strings of characters within these folders. Find the folder with the most recent timestamp (which will be the most recent backup), and look for the file named 3d0d7e5fb2ce288813306e4d4636395e047a3d28. Then copy that file to your Android phone ( put in internal storage or SD card ). Note: The quickest way to find that file is by copying the file name into your file system search bar. Step 4: In your Android phone, download the App “iSMS2droid” in Google play. Open the App and choose the option “Select iPhone SMS Database”. 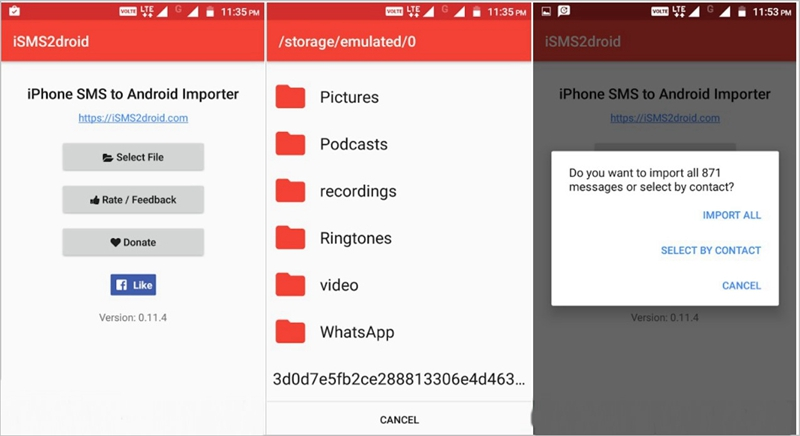 Find the text message backup file you just moved to your Android phone, click “All Text Messages” on the next screen, but if you want to import only select messages, tap Select and then select messages which you hope to import. 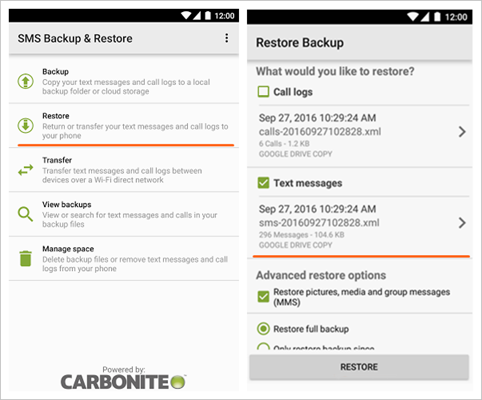 Step5: Download another App called “SMS Backup & Restore” on your Android phone, tap the option “Restore” in the first interface and it will direct you to the file directory where the converted files are, choose “OK”. Tap “Restore All Messages” and here all you need to do is waiting for the process to be completed. Having listed two methods for your reference, I hope that would be practical and helpful, and you won’t be bothered a lot about the SMS transfer problem afterwards. It’s obvious that the method1 is much more convenient with just one click while the operational steps of Method 2 are quite a lot, so I recommend this user-friendly tool – Phone Transfer intensely. What’s more, if you are changing a new mobile phone, using Phone to Phone Transfer can also help transfer other data in addition to text messages without any complex step. Hope to see your original ideas in the comment area.